Do you suffer from severe pain or discomfort in the face, jaw joint, teeth, facial swelling, neck and shoulders? If so, you may have either TMJ or TMD. 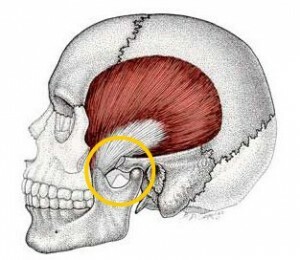 TMJ stands for the Temporo Mandibular Joint and is the region where your jaw bone and skull meet. TMD stands for Temporo Mandibular Disorder, which is typically what people are referring to when they say they have TMJ. TMD sufferers often experience jaw clicking, popping or locking during movement or chewing. In some cases, chewing is difficult, or the bite may not align properly (malocclusion). One may also experience swelling on the side of the face, toothaches, headaches, neck aches, earaches and hearing problems. The majority of TMD pain is caused my muscles that are in spasm or hyper contraction. If you have habits or activities that you do with your jaw it will most certainly aggravate the situation. Your teeth and jaw joint can become misaligned creating a bigger problem the overlaps with your teeth, jaw joint and muscles of the jaw joint area. The pain can be quite severe and can be mistaken as a common headache or migraine headache pain. In other cases you can have pain, clicking, popping or grinding. Typically this means that internal changes have happened to the joint. This could have been caused by bite problems, traumatic injury to jaw or head. Injuries such as whiplash or a physical blow to the jaw can cause damage to the delicate supporting ligaments of the joint. Some symptoms may not develop for months. If you suffer from any of these symptoms or are having trouble with the jaw joint, we may be able to help. We would need to evaluate your symptoms careful in order to help you determine the best treatment options so contact our office today to schedule an appointment.